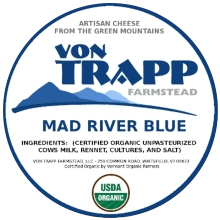 Sebastian von Trapp is the third generation to farm his family’s land in the green mountains of Waitsfield, VT, beginning with his grandparents Erika and Werner von Trapp (his ‘Oma’ and’ Opa’). Each generation has called for a fresh approach to keep the family business viable; Sebastian’s parents gained organic certification for their milk, and his on-site creamery adds even more value to their excellent-quality raw material. 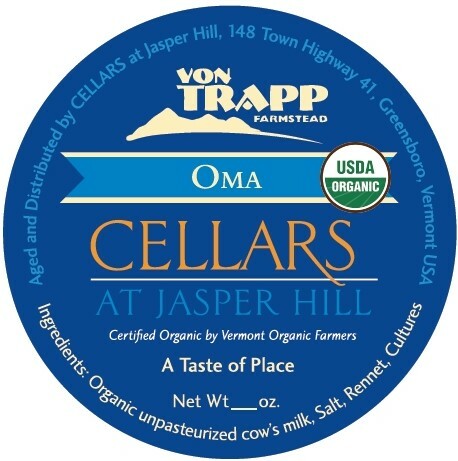 The von Trapp’s land has been in continuous operation as a dairy farm since 1959. They harvest organic milk from about 50 mixed breed cows (Jersey/Aryshire/Normande), which graze their pastures during the warmer months and enjoy hay from the farm in the winter. In 2009 a creamery was constructed in a building adjacent to the milking parlor. Cheesemaking has been a deliberate effort to keep small scale dairy operations viable and preserve Vermont’s working landscape. Regrettably, we cannot offer farm tours as we are a busy working farm. We thank you for your courtesy to that regard. Our natural rind blue cheese is aged for approximately three to four months. Made with our organic, unpasteurized cow’s milk, our Blue is as approachable as it is pleasantly complex with a mild Blue bite balanced by sweet caramel and savory meat notes. Named for Samuel S. Savage who settled the von Trapp farm in the 1700s, Savage is an Alpine-style cheese. It is hard pressed, and aged for 8-12 months.Savage is made with our organic unpasteurized cows milk, Savage delivers with bold, nutty and sweet flavors. This cheese is our soft, bloomy rind named after the peak nearest to our farm. Similar to Brie or Camembert, Mt. 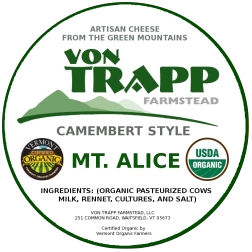 Alice has an incredibly soft, creamy texture and a savory milky, buttery flavor. We age this cheese made from our pasteurized organic cows’ milk three to five weeks. Our distinctive washed rind cheese made with our certified organic unpasteurized cows’ milk is aged at the Cellars at Jasper Hill for 60 -90 days. Oma balances slightly pungent meaty, savory and sweet flavors. The semi-soft buttery paste is surrounded by a subtle, earthy rind which is thin and mild for the style.